Play ball! 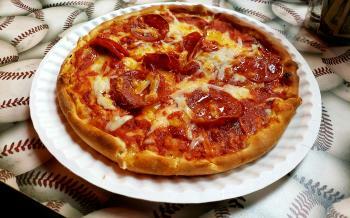 Baseball season is underway and that means gamegoers will, once again, be hitting the concession stands in droves. I don&apos;t care if I never get back. 1. Pizza (Grotto Pizza) – As far as ballpark food goes, pizza ranks pretty high on the menu of standards, but ask any Delawarean about a slice from Grotto Pizza and listen to the near-poetic response. Over the years, the pizzeria has been elevated to Valhalla-like status and consistently polls as the best in the state, so there’s no surprise that its Frawley Stadium outpost is one of the most popular food vendors in the ballpark. It’s not uncommon to see full-size pizza boxes crowd-surfing their way through the stands as large parties share whole pies or, for the more territorial set, perfectly-sized personal pan pizzas. By the way, an order of Grotto’s famous boardwalk fries to round out your meal (and defy your daily recommended caloric intake) is an absolute must. 2. Fried pickle spears (The Greene Turtle) – Mostly popular south of the Mason-Dixon Line, this mouth-puckering treat has migrated north in recent years and become a staple on many bar and restaurant menus. In fact, they’ve been a fan favorite since The Greene Turtle, the Ocean City, Maryland-based chain, debuted the dish at Frawley Stadium in 2015. Eat them “naked” or get down and dirty and slather them in ranch dressing. 3. Artisanal ice cream (UDairy) – Did you know you can get a college degree in ice cream-making? Well, not exactly—but, like the students who work at the creamery, you can certainly graduate with an agriculture degree from University of Delaware and end up creating gallons and gallons of the delicious cold stuff that crowds scramble for year-round. With flavors that pay homage to the First State, scoops like Blue Hen Tracks (a sprinkle- and peanut butter cup-studded affair) and Delaware River Mud Pie (for true chocolate lovers) are offered in pints and kid-friendly mini baseball helmets. 4. The Sweenie Donut Dog (Centerplate – the stadium’s own concessionaire) – Thank goodness someone had the foresight to shorten the name of this savory/sweet creation because “sweet weenie” doesn’t exactly roll off the tongue. At first glance, the hot dog sandwiched between a split glazed donut topped with bacon and—wait for it—raspberry jam looks like something a college-aged Dr. Frankenstein might whip up to nurse a hangover, but since it first appeared on the menu this ballpark experiment has delighted many an adventurous palate. Fun fact: Consider The Sweenie a team effort because the Blue Rocks players actually collaborated with Centerplate to come up with the salty/sweet combination, proving that the guys’ talent goes beyond the diamond. 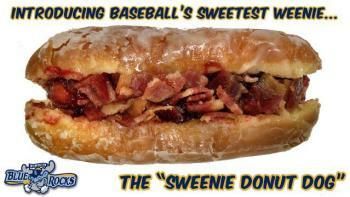 And, this tasty concoction is named after the beloved former Blue Rock and long-time Major Leaguer, Mike Sweeney. 5. Rocky’s Crab (Blue Moose Grille) – Blame it on our proximity to Maryland—Delawareans are obsessed with all things crab (including Old Bay seasoning). We often look for any excuse to incorporate the crustacean into any dish, so it shouldn’t shock anyone to find a crabmeat-topped burger being served at the ballpark. Blue Moose Grille, named after the Blue Rocks’ official mascot Rocky Bluewinkle, is the place to find the stadium’s elevated menu. Located by the 1st Base Picnic Pavillion, the restaurant is the ideal spot to enjoy a burger and a craft brew. 6. Oreo churro (Concession stand on the concourse) – Who doesn’t love a churro? What’s better than crispy fried dough rolled in cinnamon sugar? An Oreo churro, that’s what. Imagine America’s favorite cookie morphed and stretched into the shape of the traditional Mexican street snack. This creative creation is easily one of the best desserts at the stadium. There’s a reason why baseball is revered as a pastime; a day (or night) at the ballpark is a little slice of Americana that brings family, friends, and communities together and having a stadium right here in Wilmington’s backyard is something special. This baseball season, assemble a cheering squad to root for the home team and don’t forget to bring your tastebuds. For schedule and ticketing information, visit the team’s website or call (302) 888- BLUE (2583). A self-proclaimed storyteller, Iris McCarthy tells the stories that matter as a food and travel writer. She is the author of the best-selling books Food Lovers' Guide to Philadelphia and Main Squeeze: Juicing Recipes for Your Healthiest Self. Her third book, a food-focused work of fiction, is slated for a fall 2019 release. Follow Iris’ food and travel adventures on her popular blog The Palate Princess at www.thepalateprincess.comand via Twitter @PalatePrincess and Instagram @thepalateprincess.